MyBlogSpark sent my family a "Top This" pack which included one (1) free coupon for Toaster Strudel, one (1) free coupon for Totino´s Pizza Rolls, as well as some great school supplies for my boys. As soon as I opened the box and my boys say the coupons they wanted to go to the store right away. All 3 of my boys have always enjoyed Toaster Strudels for brea kfast and what kids could not live off of Pizza Rolls. With the "Top This" pack they had 14 box tops that we have ready for the boys to turn in on the first day off school, which is only 2 days away ! While we know there is still plenty of summer vacation left, inevitably the new school year is just around the corner. But this year, back-to-school will be better than ever because Pillsbury Toaster Strudel and Totino´s Pizza Rolls have teamed up with Box Tops for Education to offer something exciting for your child and their school. 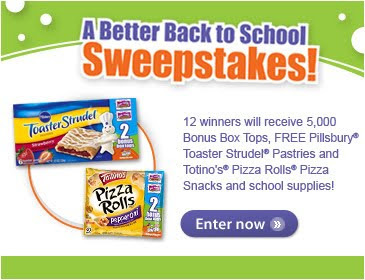 When you visit www.btfe.com/back2school you can enter to win a back-to-school prize pack as well as a chance to win 5,000 Bonus Box Tops for your child´s school, free Pillsbury Toaster Strudel and Totino´s Pizza Rolls, and school supplies from Box Tops´ newest partner, Avery. Pillsbury Toaster Strudel pastries are a quick and convenient warm breakfast to start your child´s school day. Kids love the warm, flaky pastry dough, sweet filling and creamy do-it-yourself icing. Once they return home, you can satisfy your child´s back from school hunger with Totino´s Pizza Rolls snacks - a big pizza taste in a bite-size roll that your kids won´t be able to resist! And get this - when you purchase specially marked packages of Pillsbury Toaster Strudel pastries and Totino´s Pizza Rolls snacks you´ll also find two Bonus Box Tops on each package. My favorite thing about the first day of school is first the peace and quiet because this grandma is tired and having 2 grandkids living here is a bit loud at times. I do love when they get home though and hearing how their day went.Thank you! My favorite thing about the first day of school is taking pictures of the kids. I love seeing how big they all get from year to year! My favorite thing about the first day of school is Gracie's excitement. It just makes me happy. Thanks! I love seeing the kids' excitement! My favorite thing about the firt day of school is too see my son dressed in a new outfit and to see the excitement on his face. Thanks for the chance. My favorite thing about going back to school is my kids getting off of the bus to excitedly tell me how their first day was. Your button is on my blog http://www.networkingwitches.wordpress.com right hand side. My favorite thing about the first day of school is that the kids are excited to be going! It doesn't last long. My favorite thing is that it's a new beginning; we set new goals and soar to new heights. My favorite thing is meeting all the new friends! Finding out who my teachers were going to be. The first day of school was the only time I had new everything, so I always felt very upbeat about the day. 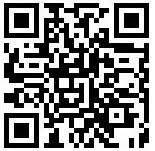 I am not certain if my previous post actually went through or not--said there was a server error, but the post had disappeared. Anyway, the first day of school is the only time I had new everything, so I always felt very upbeat about the day. Blog follower--and from looking at the previous 2, guess the first one did go through. Please ignore the fact of the basic duplication. One of my favorite things is when my son comes home with the activities/lists from the first day. I follow on twitter and tweeted about contest. Facebook fan! Thanks for the chance. my fav thing is the new supplies! nothing like opening a new boxes of crayons or writing on the first page of a new notebook! My favorite thing about the first day of school is seeing all of the children in their new clothes! My favorite thing is the kids' excitement. They are glad to see old friends, meet the teacher and show off new clothes. I loved getting all the new clothes. Thanks! My favorite thing about the firsy day of school is the socializing and the excitment of a new start with new classes, subjects and teachers! The best thing is how excited the kids get...who's in their classes, what they're going to wear, etc. My favorite thing about the first day of school was seeing what my schedule was going to be. I always loved meeting new friends! My favorite thing was being able to make new friends. The thing I loved about the first day was reconnecting with friends. I didn't get to see many of my friends over summer and that first day was always filled with excitement and seeing what classes we had together. My favorite thing used was getting to wear my new school clothes. I couldn't wait to make my mark at each new school and each new student!!!!! This will be our first year at school, but I think my favorite part will be seeing my son so excited! My fave thing about school is seeing how excited my kids are after the day is over and they saw all their friends again. My favorite is taking pictures of the kids. My favorite thing about the first day of school was always seeing old friends and the possibility of new friends! My favorite thing is the quiet of the house. When I was a child, my favorite thing about going back to school was seeing all the friends I hadn't seen over the summer. And now with my own children, my favorite part of their going back to school is that I get some "free time" back! Favorite thing was to ride the bus the first day and seeing all my friends! My favorite thing was the new school supplies. My favorite thing about the first day of school is seeing the excitement in my daughters face as she gets onto the bus. Thanks so much for such a wonderful giveaway! well sleep first off LOl i can take a nap. but i cant wait till the kids get home and tell me everything that happened and about thier new friends. I get to have more me time! My son just started school yesterday! My favorite thing was how excited he was when we picked him up! My favorite thing about the first day of school was seeing all my friends again after the summer & finding out who my new teachers would be. My favorite thing about the first day of school is the look on the kids faces when they get off the bus after school, smiling from ear to ear. Seeing how happy my kids are to see their friends again! The excitement on my kids faces. In elementary school, my favorite thing was all the new crayons and pencils and paper. Just new stuff in general and the anticipation of learning new things. By high school, I dreaded going back to school. My oldest son is just starting kindergarten this year and doesn't start for 3 wks. I am nervous, scared and excited all at the same time. I can't wait to take his picture when he's getting on the bus for the first time. Getting to see all my friends again and shopping for new school supplies - cute lunchboxes, binders, etc.